Of course. What did prosecutors expect? If they knew the first thing about Islam, they would know that Rahimi indeed has no respect for what he considers to be manmade, Infidel law, as opposed to what he thinks is divine law, Sharia. 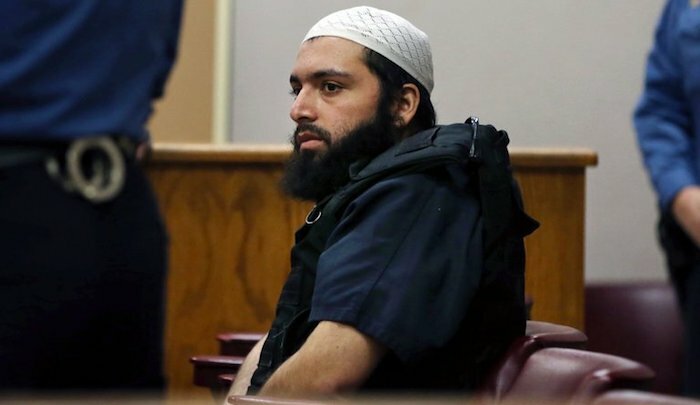 Convicted Chelsea bomber Ahmad Khan Rahimi has been unrepentant while locked up, according to federal prosecutors who argue he should get life behind bars at his Feb. 13 sentencing. Rahimi was convicted of detonating a series of bombs in New York and New Jersey in 2016. While locked up, he has tried to “radicalize his fellow inmates and made light of his attacks,” prosecutors say in court papers filed in Manhattan federal court Tuesday. Rahimi wrote in a letter to a friend on Dec. 12, just two months after a jury convicted him for the September 2016 attacks, “My Judge is a kaffir, my lawyer is a kaffir, my prose[c]utor is a kaffir, and my jury are all kaffirs,” court papers state. Kaffir is a term used to refer to a non-Muslim. Rahimi, 29, continues in the letter, “Who among them will understand the Muslim problem. Their hands are already drenched with Muslim Blood and how will they understand our struggle.”… While locked up at Metropolitan Correctional Center, Rahimi has also allegedly shared materials from his trial with other inmates, according to the feds. “His conduct reflects a complete lack of respect for the law and indicates that he has not been deterred, but rather emboldened,” prosecutors wrote in asking the judge to sentence Rahimi to life behind bars.